The newest addition to EMC's downtown campus is located at 219 8th Street in Des Moines, IA. This four-story, 106,000 sq. ft. building supplements the company’s existing space and is used for offices, training, meetings, development and much more. Envisioned as a glass jewel box, the structure features a triple pane glass, pressure-equalized rainscreen curtain wall system. The triple-pane system brought with it necessary accommodations in weight and installation, which required intense coordination between the structural frame and the location of the curtain wall embeds. However, this type systems allows for increased sustainability and design freedom. To further bring the architect’s vision to life, an inventive stepped-out mullion system was created specifically for this project. In addition to the custom glass curtain wall, the building’s façade also includes granite and metal panels as well as skylights. Through this addition, access to existing EMC building was made possible through internal skyway connections. A 100-foot linear skylight spans the length of the 3-story public skywalk, giving those walking through the opportunity to see all three campus buildings come together. 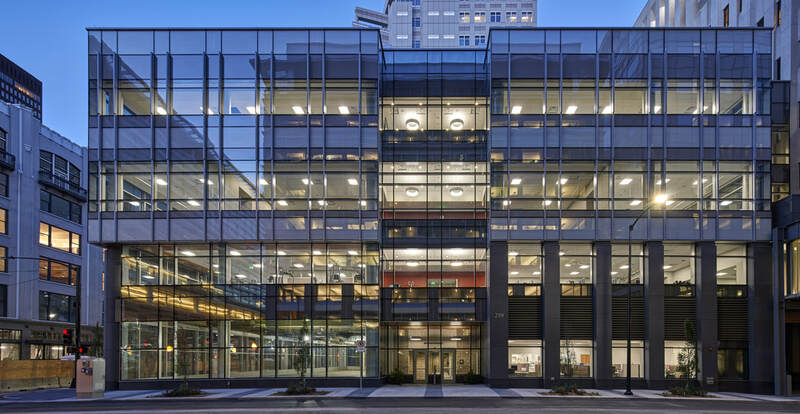 Given the location of the building in downtown Des Moines, this project required an exceptional amount of communication and attention to detail and surroundings. In addition to the already existing downtown conditions, a fire in the building across the street added to the complexity of the project. EMC 219 8th Street achieved LEED-NC Gold certification in July 2018.